Gîte Les Ménétriers - Le Tokay*** is a property located in Ribeauvillé near Château du Girsberg. 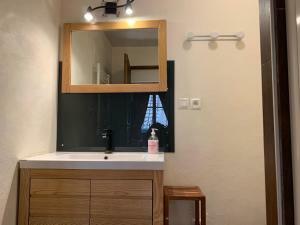 This apartment is 1.9 km from Château de Saint-Ulrich. The apartment is fitted with 1 bedroom, a flat-screen TV and a fully equipped kitchen that provides guests with a microwave. Château du Haut-Ribeaupierre is 1.9 km from the apartment. Strasbourg International Airport is 59 km away. Public parking is possible on site (reservation is not possible) and costs EUR 2 per hour. This property will not accommodate hen, stag or similar parties. Please inform Gîte Les Ménétriers - Le Tokay*** in advance of your expected arrival time. You can use the Special Requests box when booking, or contact the property directly with the contact details provided in your confirmation. A damage deposit of EUR 200 is required on arrival. This will be collected as a cash payment. You should be reimbursed on check-out. Your deposit will be refunded in full in cash, subject to an inspection of the property.